I'm not much of a chess player. I learned the game by playing Chessmaster on my Game Gear back in the day (true story), and I was a member of the loosely knit Chess Club in high school, but I'm not exactly what you would call "good" at the game. (Backgammon is more my style.) But that doesn't mean I can't appreciate a nice chess set, like the DC Comics Justice League one which is going to be released by Eaglemoss. The crew at Eaglemoss have just finished a Batman themed chess set, so this one seems like a logical next step. The Heroes side is well stocked with heavy hitters, and who rates one of the 16 spots but the Winged Wonder himself, Hawkman! Now, admittedly, he is a pawn (Queen's Pawn to be specific). But actually, that fits. If you take a look at the image above, who makes up the back row? The Founders of the Jusice League! It blends the "Big 7" of the old continuity with the "Big 7" of the new continuity, so Martian Manhunter and Cyborg both make the cut to give us our 8. Now matter how you slice it, no "Hawkman" was ever a JLA Founder, so I'm alright with him being a pawn. Besides, he's in good company up there, with long time frenemy Green Arrow, Silver & Bronze Age teammates Zatanna and Firestorm, Modern Age teammate Power Girl, plus Supergirl, Shazam (is he called Shazam now? Or Captain Marvel? Ugh.) and everybody's favorite Booster Gold. Some "heavy hitters" up front! As an aside, I just love the fact that the Martian Manhunter is a Knight. I can't explain that, I just do. These Eaglemoss sets come out one piece at a time, like a subscription service. I doubt I will pick up the whole thing, since I already have a perfectly nice chess set for my wife to beat me on, but a Hawkman chess piece would look very nice on my Hawk shelf! 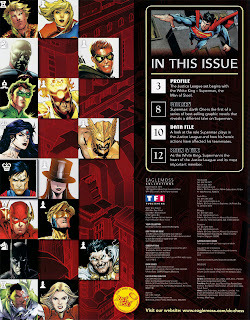 Image: Eaglemoss Justice League Chess Set preview, 2013, image obtained from Firestorm Fan. One of the best superhero podcasts on the Internet is run by two friends of mine, Rob Kelly of The Aquaman Shrine and The Irredeemable Shag of Firestorm Fan! The Fire And Water Podcast is a celebration of their two marquee characters, the King of the Seven Seas Aquaman, and Firestorm, the Nuclear Man! And the two of them have taken a huge risk by having yours truly on their show! The three of us talk about something very familiar to fans of Hawkman, Aquaman, and Firestorm -- cancellation! What happens when your favorite character's book is cut from the rolls? And with these characters, there is a lot of options to choose from for cancellations, and emotions run the gamut. I had a lot of fun talking with Rob and Shag, and I think you guys will enjoy it as well! You can download the episode right here, so click and enjoy! Support Firestorm and Aquaman (and Hawkman)! Fan the Flame and Ride the Wave (and Flap the Wings)! 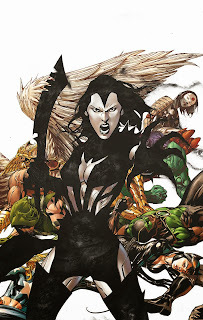 Justice League of America #7.3: Shadow Thief Solicit! September has become the new annual month for special events at DC Comics, and this one is no exception as the Forever Evil miniseries spawns an entire month of villain-centric issues, as the bad guys take over all of the titles. As Hawkman ostensibly stars in Justice League of America, one of the four JLoA books stars none other than the new Shadow-Thief! Take it away, solicits! Where is the line between duty and villainy? For the new Shadow Thief, there is no question: Her mission to eradicate all alien life on Earth is above questions of morality. Armed with technology that allows her to become a living shadow, the Shadow Thief wages a covert war across the globe, but how long can she stay in the shadows before they consume her soul? Very intriguing! In the short amount of time we got to know her, the new Thief was a very mysterious character, so getting a whole issue to focus on her and establish her for use in the larger DCU is a nice bone being thrown to us Hawkfans by the DC Braintrust. Artist Chad Hardin is known to me from his work on the modern Warlord title from DC, which I really dug, so all good there. Although it is a little ironic that Tony Daniel (the initial writer of Savage Hawkman) is doing the cover! I do have to ask -- does she have the hyphen, or not? There's a whole slew of cool-sounding baddie books coming out in September (Eclipso! Creeper! Man-Bat! Killer Frost! Reverse Flash! Brainiac! And so forth! ), so DC has found a way to get even more of my money. You can find all of the Villains Month solicitations right here. Will you be picking up the Shadow Thief one-shot? What other Villains Month books will you get? Image: Justice League of America #7.3: Shadow Thief, Tony S. Daniel, 2013. Poll Results: Are You Buying Justice League of America? I try to do a poll every now and again here on the blog in order to see how my thoughts and opinions on developments line up with the opinions of the readers of the blog. Now that Savage Hawkman has ended, the only place we can read about Hawkman is Justice League of America. So I asked the obvious question: Are You Buying Justice League Of America? The tally here was a little surprising. If the title in question was Justice League, this number would be right on the money, as I tend to hear positive buzz about that series online, much moreso than JLoA. But it looks like DC's efforts to promote this series have paid off! This was the answer which I knew would win the tally, so no shock here. Especially on this blog! This is the camp I fall into. As much as I like some of the characters in this series, if Hawkman was to be removed from the title I would drop it. Too much focus on characters I couldn't care less about (*coughcoughCatwomancough*) and too expensive, even with my DCBS discount. The books is good, but I don't think it has reached "cream of the crop" status yet. But the presence of Hawkman is making it worthwhile for me at the moment. Honestly, I expected this number to be higher than only 3 votes. I've heard a lot of complaints about Justice League of America on message boards and such, so I figured that the number of folks who would say "screw it" would take second place on the poll. Is this indicative of the opinion folks have of the title's quality? I think that the upcoming Trinity War series will give the series a bit of a shot in the arm, and hopefully we can get more focus on Hawkman in the coming months. So we'll see, I suppose. After earning two degrees and working in industry, Luke decided to start blogging. He now devotes his time to his hobbies: peeling things off of other things, and watching the radio. Welcome to my journey into Hawk fandom! This blog covers all generations of the Winged Wonders, Hawkman and Hawkgirl, from the Golden Age to today, and everything in between. Are You Buying Convergence: Hawkman? Is Green Arrow the Mac? ?